Teachers, Students, and Quizmasters! 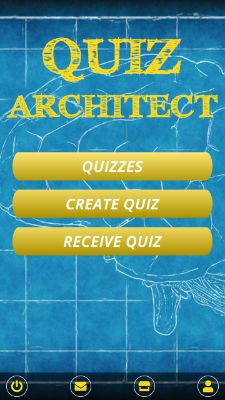 This is the App you need to create quizzes, exam preparations or training material with ease. Whether you carefully craft every question and answer or import questions from Excel lists – it has never been easier to create challenging and fun multiple choice tests. Pick a name, a quiz type and a language. Choose between Single Choice, Multiple Choice or True/False questions. Enter the question text, up to 6 answers and mark the correct one. Assign a difficulty if you like. On mobile devices, you can turn simple comma-separated lists into complete practice tests. Just paste the list into a field, pick which column ins the question and which one the answer and hit enter. The App creates the quiz and random wrong answers for you. Combine them with you manually crafted questions. On desktop devices, you can import complex CSV files which you can easily create in Excel or Open Office. Customize and handcraft the ultimate learning experience for yourself or your students. Good multiple choice tests show the user an explanation. Add a helpful text for each question to create the perfect learning experience. Relax in between with a nice and fun Trivia quiz, all in the same App. Create a partner quiz and see how well your wife, husband spouse or friend really knows you. You can directly share your quizzes between devices on your home network. Challenge your partner or just transfer your creations from mobile to desktop. When you prefer printed material you can export all your exams or quizzes to simple text format to print it out. Create HTML pages to include on your website. Export to CSV so you can keep on working on your tests in Excel or Open Office. The free version is fully functional, on mobile devices it features ads and an import/export/question limit of 25 per quiz.